A better alternative for Lambeth North junction? You only have until this Friday 31st to respond to Lambeth's consultation on plans to improve Westminster Bridge Road around Lambeth North station, and I urge you to do so if you can after skimming through this blog post. Much of what is proposed is good in my opinion - making the railway bridges more appealing to walk through; a better junction between Lower Marsh and both Upper Marsh and Carlisle Lane. 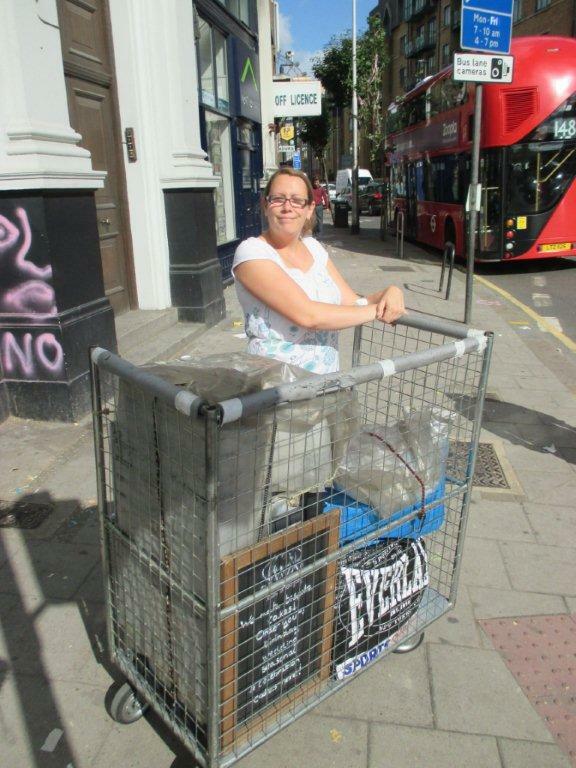 In particular the proposal to filter Hercules Road and stop it being a rat-run is good. However I'm not convinced the proposal for the junction outside Lambeth North station, where Westminster Bridge Road meets Baylis Road and Kennington Road, is good enough. a) Baylis Road - Kennington Road - Hercules Road is currently LCN+3 and will be a Quietway - the plans need to work for near market cyclists such as secondary school pupils. b) Westminster Bridge Road is likely to become more appealing to cyclists when the East-West Cycling Superhighway turns Parliament Square into a better place to cycle. TfL also have plans in development to improve Westminster Bridge and the 'unroundabout' at this end, most likely including segregated lanes/tracks. This plan needs to fit into that development. 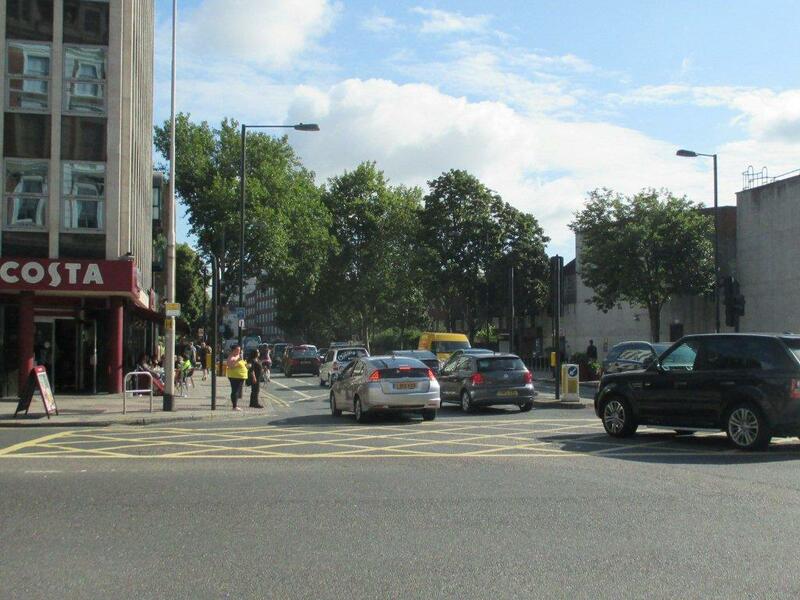 The plan under consultation retains two lanes of traffic setting off from the lights to go into one lane on the other side, so there will still be traffic jostling and beeping its way through the junction, making for a stressful and noisy place. Wouldn't it be better to keep the cyclists in a lane to the side of the traffic and have one motor traffic lane going smoothly away from the lights into one lane on the other side? No need then for motor traffic to wait five seconds for some of the cyclists to set off, and there's no conflict with them. If there is an impact on junction capacity, it is worth asking why we should prioritise the handful of drivers in the largely otherwise empty cars above over the safe movement of adults and children walking or cycling, given that both Lambeth and the DfT place cars lower in the road user hierarchy. Half way across the Pedestrian Light has gone red and she's in a vulnerable position. 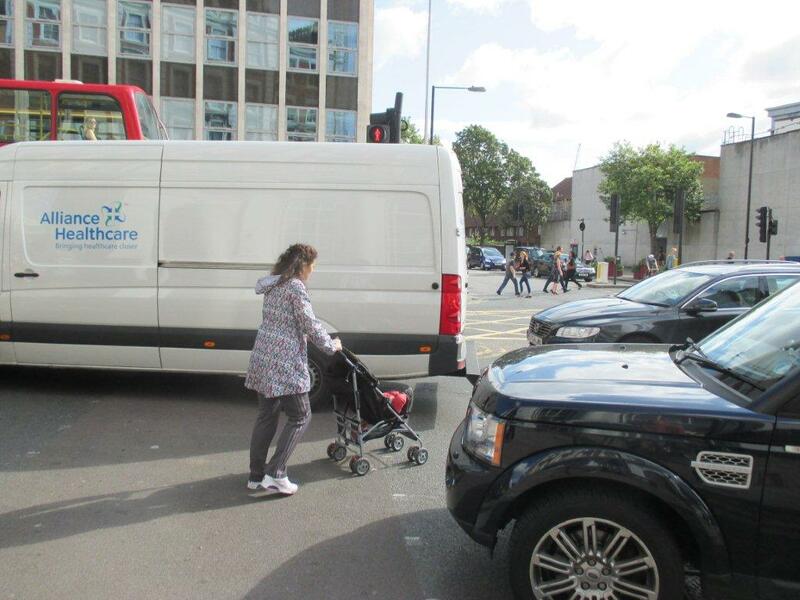 With one lane of motor traffic it would be far easier for her to get across, and she would be more likely to be able to influence a driver to wait short of the pedestrian crossing line (as the Range Rover driver has done). Two lanes of traffic fighting to get into a single lane is a cause of the clogging up pictured here. 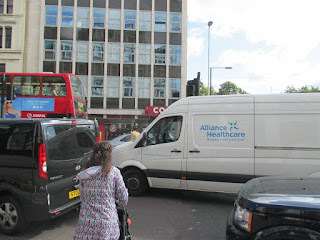 I had to wait through three phases of lights before I was able to walk across Westminster Bridge Road this morning shortly after 9am, and I chatted while I waited with this person who told me it can take her up to fifteen minutes to cross the road to make her delivery. 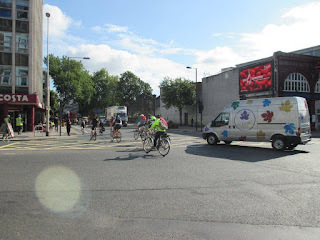 Cyclists set off from a 3-metre wide cycle lane in 18m wide Kennington Road towards Baylis Road at the same time as motor traffic going straight ahead to Baylis Road. 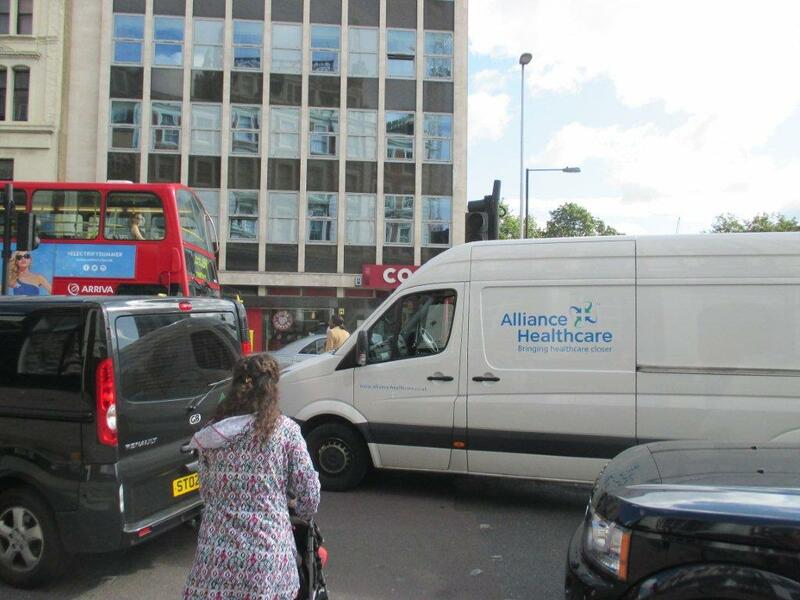 Traffic wanting to turn left into Westminster Bridge Road is held. At the same time cyclists and motorists are setting off in their own lane (3m wide each) from Baylis Road to Kennington Road. There's plenty of pedestrian green time for pedestrians to cross the full width of Westminster Bridge Road (north and south of the junction) in one go, rather than two at present. The straight on traffic is held. Now cyclists and motorists turning left from Kennington Road to Westminster Bridge Road go, along with the motorists turning right from Westminster Bridge Road into Kennington Road, and the cyclists from Westminster Bridge Road who are turning right, going straight on to continue down Westminster Bridge Road, or turning left into Baylis Road. Pedestrians are likely still to be able to cross Baylis and Westminster Bridge (south side) Roads. It is now the time for Westminster Bridge Road traffic to go straight on, though cyclists heading south have to wait (limitations of a 1.5m lane due to restricted width and three motor traffic lanes). 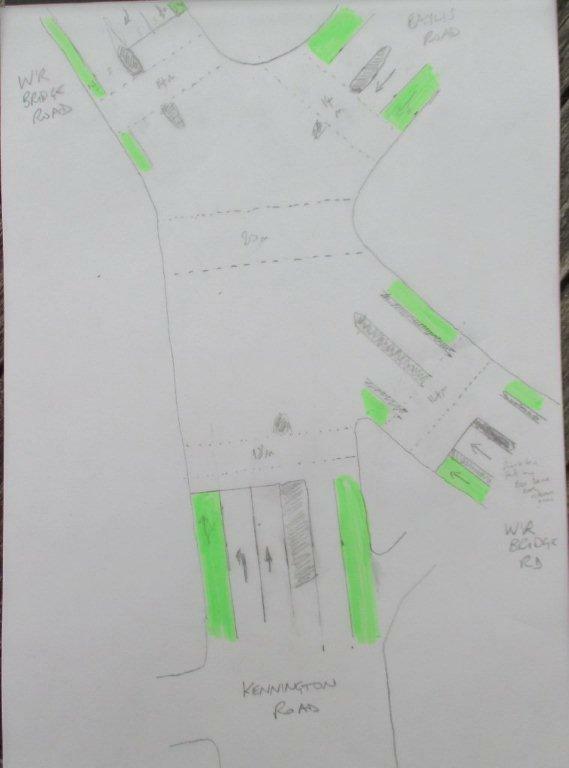 Pedestrians gain a green phase long enough for them to cross Kennington Road or Baylis Road in one go. 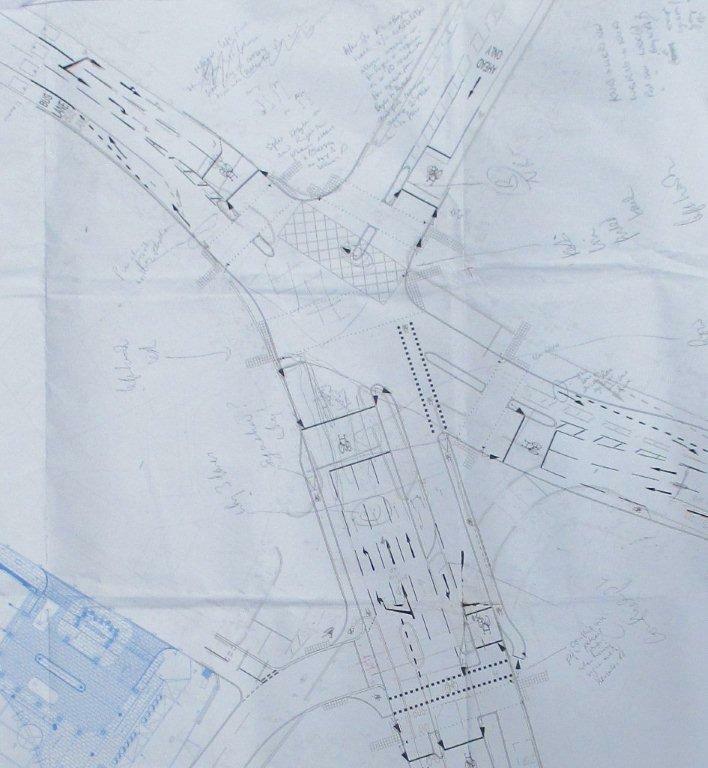 I've left in the central pedestrian crossing included in the consultation drawing. It requires traffic from all four directions to be held on red. I think that my plan, which includes a 'straight over in one' crossing over Kennington Road and Westminster Bridge Road both of which currently have a two-phase, staggered crossing, may mean that a central pedestrian crossing is not required. There's a significant gain in pedestrian crossing ease in my plan, alongside no risk of cyclists being left-hooked by motorists and child friendly junctions. If the planned all-red pedestrian phase is not needed that is to the benefit of motor traffic capacity. 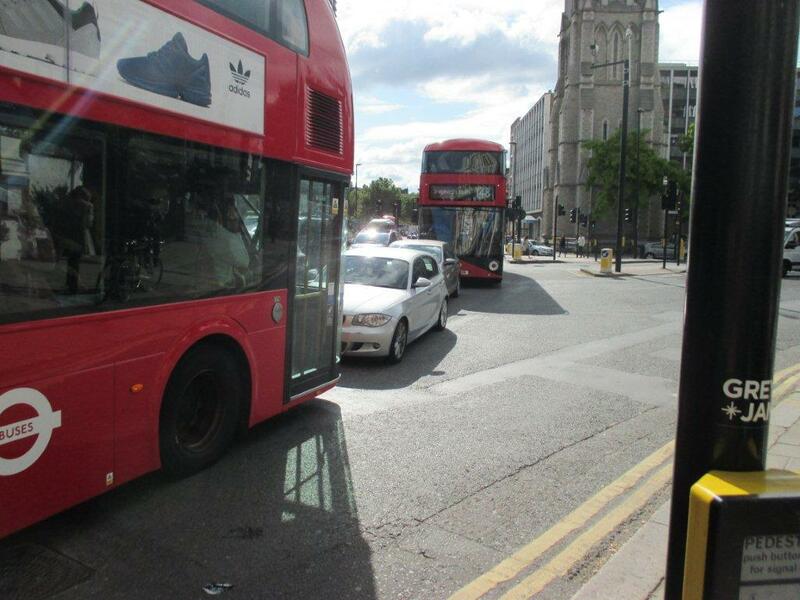 Bus lanes remain in place, the bus gate on Kennington Road remains, and it may be worth adding as similar one of Westminster Bridge Road approaching the junction from the south. 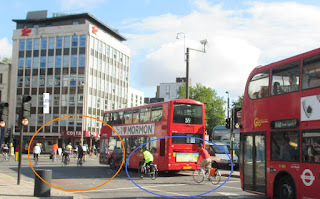 The provision of wide cycle lanes away from motor traffic is likely to encourage more people to cycle, in time reducing the need for so many buses (though without reducing the need for a regular and frequent bus service). 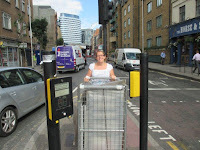 It may also give confidence to some to switch to a less space intensive form of personal transport than the car. 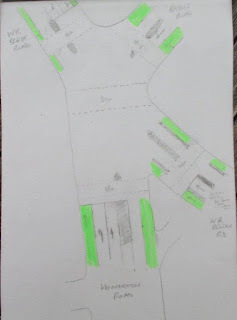 If you think a scheme such as I've outlined above makes sense to explore please say so on the online consultation form (and, I suggest, tick that you support the Hercules Road point closure and floating bus stops on Baylis Road) at www.wbrproject.co.uk this week. Should these streets be reopened to through motor traffic? 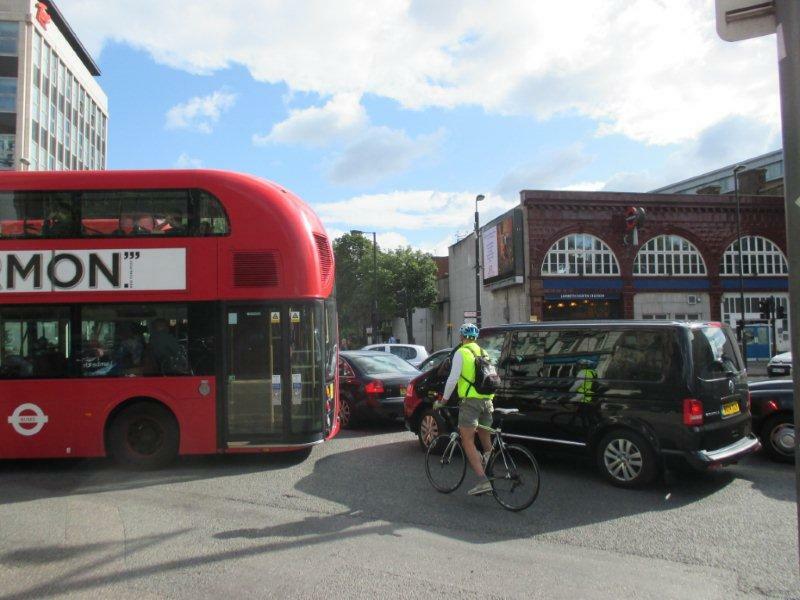 There have been two articles written in the past few days that are pertinent to Lambeth where a decision to undertake a six month trial on measures to prevent traffic rat-running in the Loughborough Junction area has been called in. The borough wants to be the most cycle friendly borough and has a lower level of car ownership but how can progress be made when there's hesitation to even trial a scheme? The first article in the June edition of Highways Magazine outlines the benefits of 'taming' streets by closing them to through motor traffic. 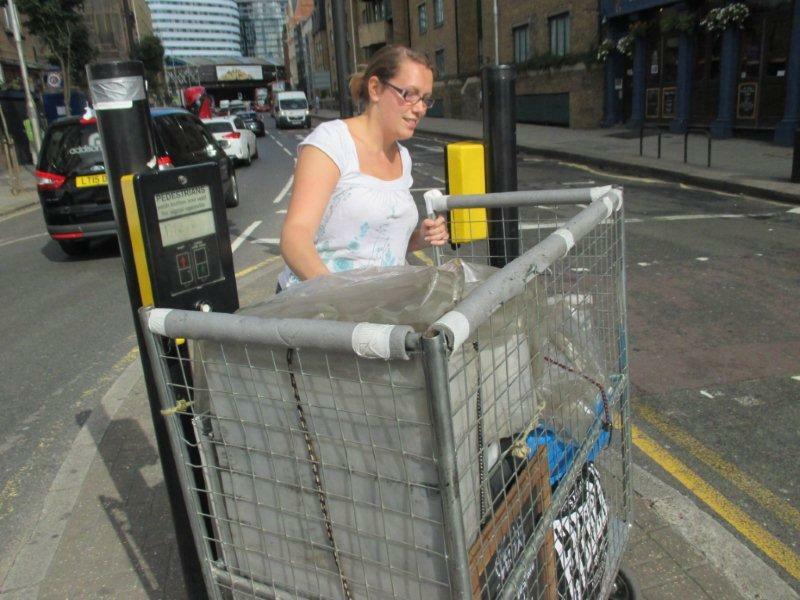 Access is retained for motor vehicles while calm, convenient and safe through routes are created for people of all ages walking and cycling. Within Kennington check out the little enclave of streets around Walcot Square; a child-safe place because motor traffic has been prevented from cutting through via Brook Drive. 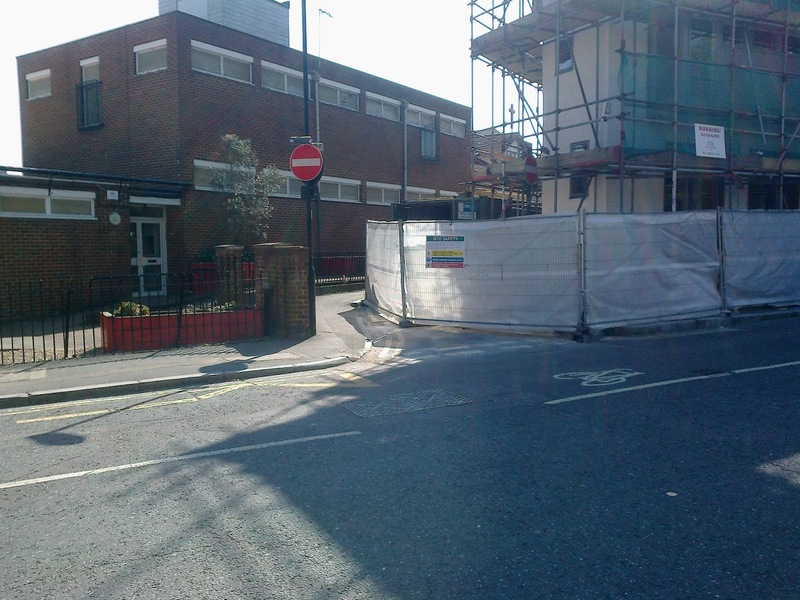 Likewise Cleaver Square is enhanced by a motor traffic barrier onto Kennington Park Road that prevents cars and vans cutting through to and from Kennington Road. 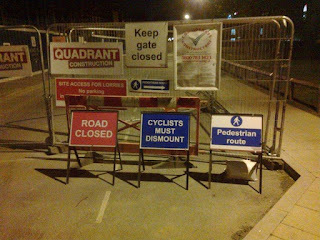 The second article, 'Trying it out', on the As Easy As Riding A Bike blog, questions why Councils don't try temporary closures to help them decide whether a street can permanently have through motor traffic filtered out. Change is challenging for people and even a temporary experiment may lie beyond the comfort zone of some politicians. 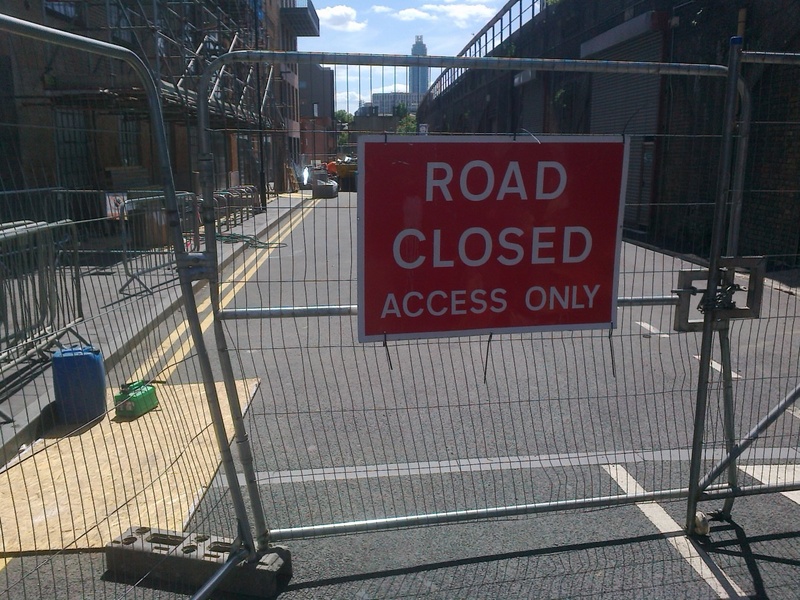 But what happens when there are long-running temporary closures for other purposes? Can the politicians and the council use this experience to assess whether there are benefits in reopening the street to through motor traffic? There are three of these long closures in north Lambeth and I really hope the authorities won't just reopen the streets without really determining whether doing so is beneficial. Newport Street has been shut for at least two years for the creation of Damien Hirst's new gallery. Newport Street forms part of the Missing Link, the green trail from Vauxhall to the Garden Museum by Lambeth Bridge - a continuation of the new Linear Park between Battersea Power Station and Vauxhall. Why re-open this to through motor traffic on a green trail when it's been shown not to be necessary for two years? After all, taxis and coaches can drop gallery visitors off at the Albert Embankment, rather than fouling up the green trail, leaving it fantastic for adults and children walking or cycling. Nearby there's St Oswald's Place, a minor one-way street which could usefully be two-way for cycles except that there's a narrow part on a blind corner at the junction of Tyers Street. 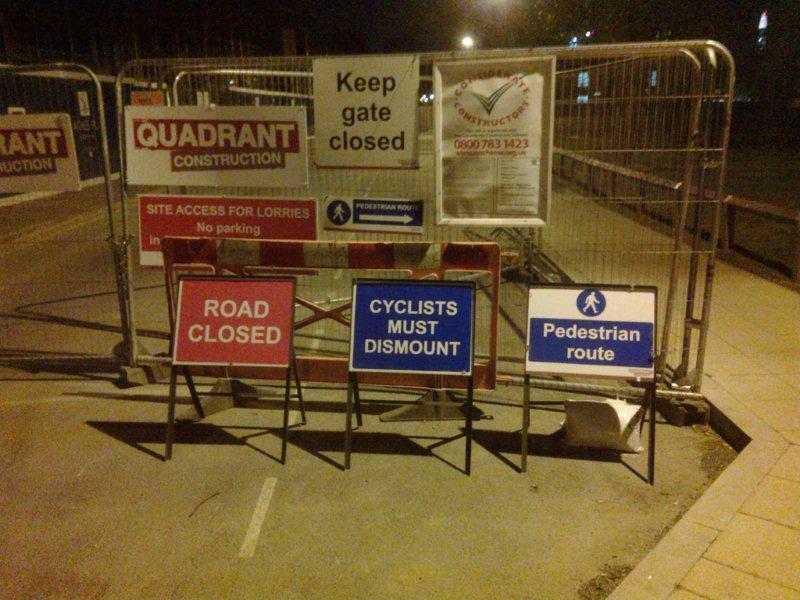 This junction been closed for months now as a building is constructed. It could be reopened as a two-way walking and cycling junction if motor traffic is filtered out. It's working now, why not keep this option? St Oswald's Place links to a useful Toucan crossing over Kennington Lane. A great improvement for cycling while retaining motor vehicle access. Finally St Agnes Place / Bolton Crescent, at the back of Kennington Park, has been shut for over two years while some housing is built. 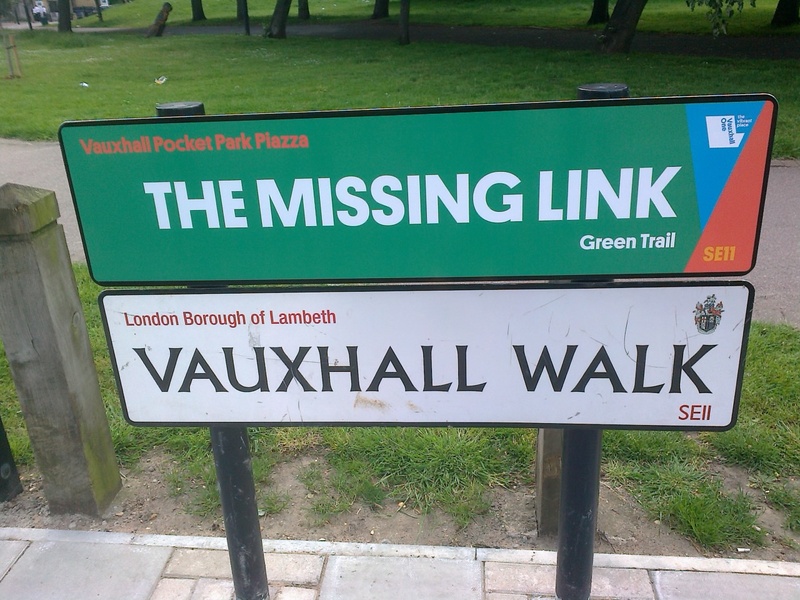 It is a quiet cycle route to Foxley Road and down to Loughborough Junction. 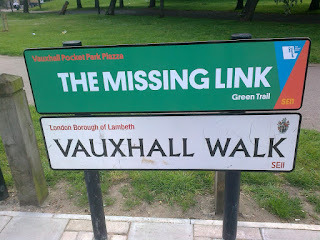 There is an improved green walking and cycling link being created through Kennington Park just beyond the closure below. Why not keep the closure to motor vehicles, which wouldn't prevent access to the new homes but would stop drivers taking a short cut through this street. The two year closure shows this is practical, and the benefits for people wishing to get around on bikes are clear. 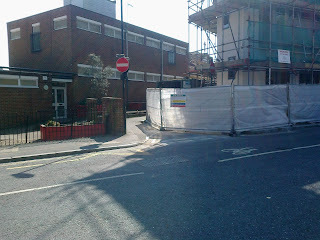 Why re-open the street and risk the new residents not permitting their children to cycle to school?